Creamy Alfredo sauce over rice, chicken, and vegetables…..irresistible! Even better, it’s incredibly easy to prepare. 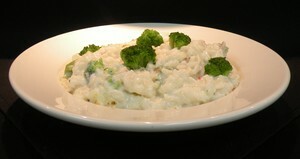 Combine Deluxe Alfredo Sauce, rice, chicken, and broccoli. Divide rice mixture evenly between two 2½" deep half pans. Sprinkle 1 cup mozzarella cheese over each pan. Bake until internal temperature reaches 165° F. Begin to check temperature of product after 30 minutes in oven.